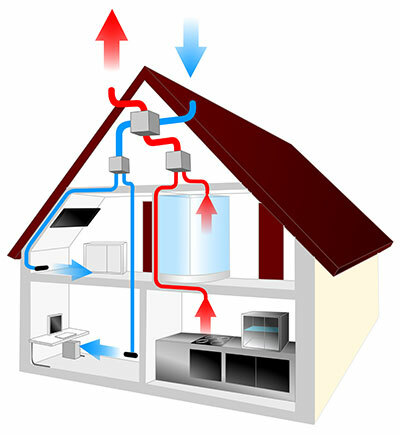 Heat Recovery Systems work by extracting the stale, moist and polluted air from wet rooms, utility rooms, kitchens, bathrooms within a home. This air passes through the heat recovery unit at the same time as the fresh outside air is passing in. The clean fresh air passes through the filters and is heated by the warmth extracted from the stale air, providing all living rooms, dining rooms and bedrooms with fresh clean air with no loss of temperature. The heat exchanger maintains separation of the extract and supply air flows. A Heat Recovery system runs continuously on low speed, with a boost facility which can be activated via various controllers and sensors depending upon the unit. A Heat Recovery system gives a constant flow of fresh air, controls condensation, increases your security and lowers your carbon footprint. Mechanical Extract Ventilation (MEV) provides continuous extraction of stale, damp air from all wet rooms such as kitchens, bathrooms and utility rooms. The system costs less to supply and install than individual separate fans and helps to reduce the amount of background ventilators required. MEVs are suitable for a wide range of buildings from individual apartments and houses to student accommodation units and nursing homes, and can be designed to ventilate either an individual house or several apartments simultaneously. MEVs require minimum installation and provide maximum retention of valuable warm air in wintertime. Options include demand control mechanical extract which operates with humidity controlled grills. Coopson Technologies Ltd offer a commissioning service to ensure your new build property has the correct balanced airflows to meet Building Regulations Part F , the Domestic Compliance Guide and NHBC mechanical ventilation guidelines. 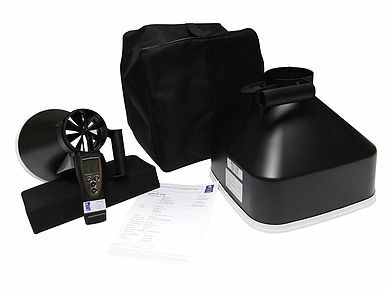 All mechanical ventilation systems are required to be balanced and commissioned to the design airflow rates based on the size and occupancy of the dwelling, in accordance with Building Regulations Part F. (hyperlink to Building regulations part F and the domestic compliance guide) Airflow measurements should be taken using a calibrated airflow anemometer with proprietary hood attachment and results recorded in litres per second for each grill located within the property. Our fully qualified engineers will commission your property, and make adjustments to the fan and grills where necessary to ensure design rate airflows are reached. We will then provide you with a full commissioning report. If you would like us to provide the calculations for your airflow requirements, we can also offer this service along with our design and supply services. It is also advisable to have systems re-commissioned every few years to ensure correct airflows are still being achieved for the wellbeing of the occupants and the fabric of the building. Modern heat recovery systems provide a constant supply of clean fresh air without losing heat, making your property 'greener' and cleaner. Proper maintenance and servicing is essential to ensure the system functions properly, both for the health of the occupants and to minimise running cost. Dirt can build up in the filters, on fan blades or ductwork if the system is not well maintained and filters are not changed regularly, which can increase operating costs by as much as 60% as well as seriously reducing the flow and quality of the air in the home. Humidity, carbon monoxide and other pollutants can increase in the air within the property. Coopson Technologies Ltd have been trained by Bpec to install domestic ventilation systems including intermittent mechanical extract fans, continuous mechanical ventilation systems (MEV) and continuous mechanical ventilation with heat recovery systems (MVHR). To ensure compliance with Building Regulations Approved Document F and the Domestic Ventilation Compliance Guide, these systems should only be installed by competent installers. Once installed, these systems should be properly adjusted and commissioned, and air flow rates should be measured and certificated. We can offer our customers a full service, including design, installation, commisioning and certification. This will ensure your ventilation system complies with statutory requirements. If you are an installer that requires a ventilation system inspecting, testing and commissioning, we can offer you that service. We will carry out a thorough inspection of all accessible components of the system, measure the airflow rates of the system to ensure they meet the design airflow rates and certificate the system. If any parts of the system do not comply with the design, we will be happy to provide guidance on how to rectify these issues or carry out remedial work. This will ensure that your installation complies with Building Regulations Approved Document F and the Domestic Ventilation Compliance Guide. Coopson Technologies Ltd also offers a maintenance program for your ventilation system. We can replace filters, clean system components and check air flow rates to make sure that your system is still performing as well now as it was when it was installed. This will ensure that your system works efficiently while providing clean fresh air throughout your home. We can also install system components and controls to ensure your ventilation system only operates when it is required. Timers, controllers and humidistats are a few of the options that can help make your system more energy efficient. Part F building regulations are part of the government's commitment to reducing energy consumption and carbon emissions. New buildings are rigorously tested to ensure heat loss is kept to a minimum. The regulations deal with the need to ventilate properties effectively and recommends air flow rates for various systems.